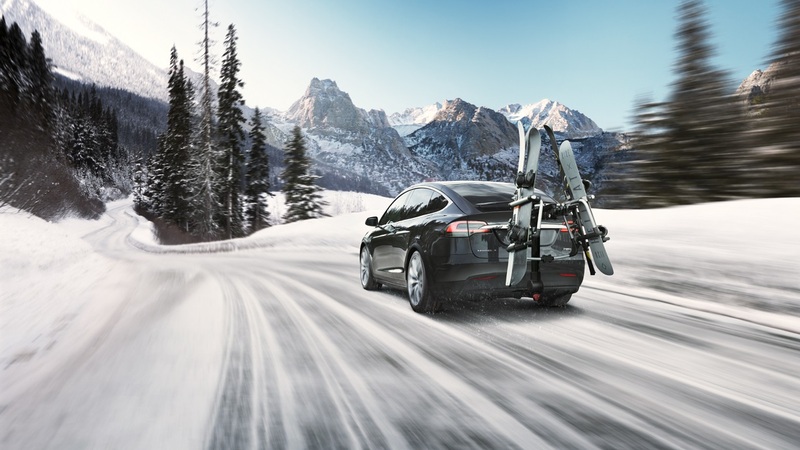 Experiencing range anxiety during cold weather with your Tesla Model S or X? This tutorial will guide you through using EVTO’s unique features* to determine all of the effects of inclement weather on trip planning. Winter driving can play havoc on electric vehicles range with not only wind, precipitation, road slush and cabin heating, but with the Tesla Model S and X, battery heating can also impact range whenever the temperature is below 10º C / 50° F. EVTO takes all of this and more in consideration while determining your energy consumption and therefore your routing and charging stops. * Many of the capabilities described in this tutorial will require a subscription to unlock these features. * This tutorial requires EVTO at version 3.0 or above. There is little to actually do with EVTO to prepare it for winter driving, but there is a lot you should consider when planning a trip with an electric vehicle in these conditions. This tutorial will be split between various techniques we have learned about driving Teslas in extreme weather as well as the capabilities within EVTO to plan for and mitigate these negative effects in order for your winter driving to be as stress free as possible. The first order of business will be to define your cars winter characteristics. While you can change the few features mentioned in this section seasonally, you might want to use the multi-car feature of EVTO and describe both a winter and non-winter version of your car. 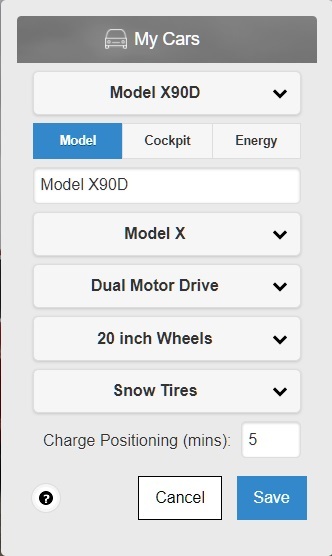 For this tutorial we have chosen a Tesla Model X90D with snow tires. When driving a Tesla in the winter many choose to lower the cabin temperature of the car slightly and make up for this by using seat heaters which are more efficient. You may choose a different cabin temperature during winter for this reason, or you can keep the same temperature all year round. Note that EVTO calculates cabin heating and cooling based on the ambient temperature outside so the larger the difference, the more energy the car will consume and EVTO will have to plan for during your trip. This is one of the reasons it’s important to set the date and times of planned trips. EVTO obtains forecasted weather data for each stop along your route in determining your trips energy needs. Select My Cars from the main menu. We now have a winter car profile that we can use to easily create trips for inclement weather trip planning. 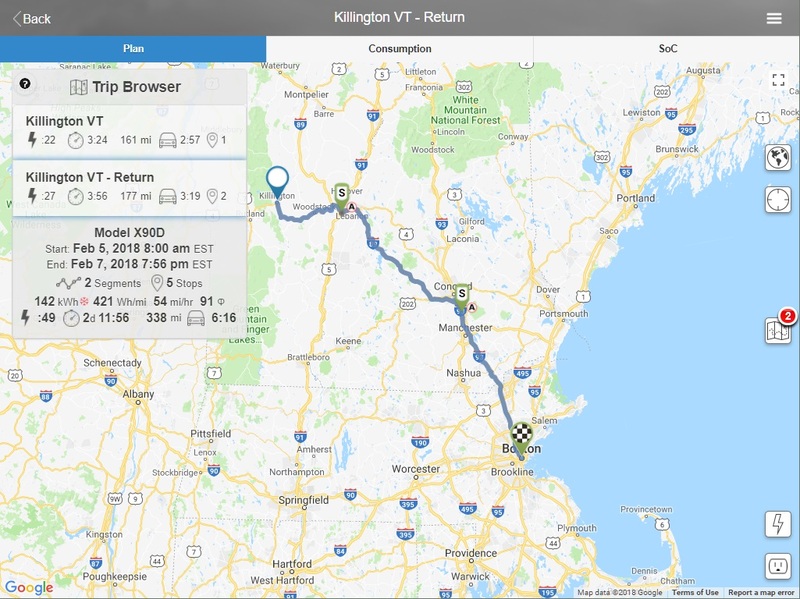 You can use this car profile when creating new trips or you can copy an existing trip in Current Trips and then assign or Move the new trip to your winter car profile. Don’t be surprised if the routing and charging is different with the same trip during the summer or winter seasons. Our demonstration trip will be from Boston, MA to the winter resort area of Killington, VT. In the summer months we can easily make it to this destination and back home in Boston just by stopping at the West Lebanon supercharger one time. In the winter it will be more challenging due to weather that affects the cars efficiency. EVTO will help us deal with this seasonal change, which you will see is quite dramatic. For the Origin, enter your starting address. Let’s plan our round trip from the city of Boston, MA. 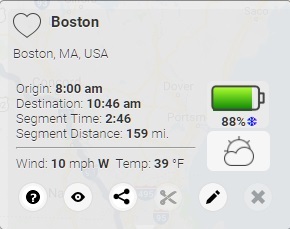 In Origin, enter boston, then select the Boston MA result from EVTO’s list of suggestions. 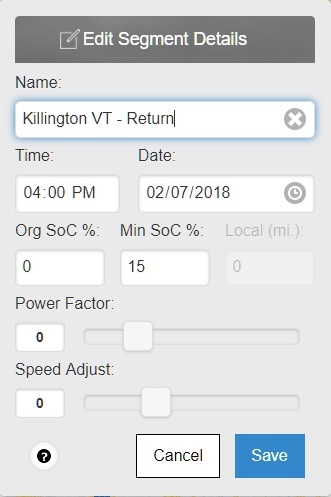 For the Destination, enter killington, then select the Killington VT result from EVTO’s list of suggestions. Select Plan as round trip to create a two segment round trip. 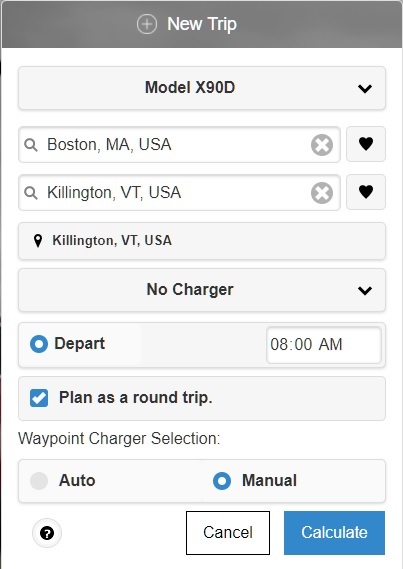 We have chosen a manual Waypoint Charger Selection in this scenario because we want to set the travel date and make adjustments to the trip’s settings before EVTO takes over the energy calculations, charger selection and routing. We need to set our trip date for our planned winter, three day vacation. We plan on leaving Boston in the early morning of February 5th, 2018 and arrive in Killington in the late morning. We can then get a quick bite to eat before getting in an afternoon of skiing. We will ski both Saturday the 6th and Sunday the 7th before departing for Boston at 4pm for a late evening arrival. 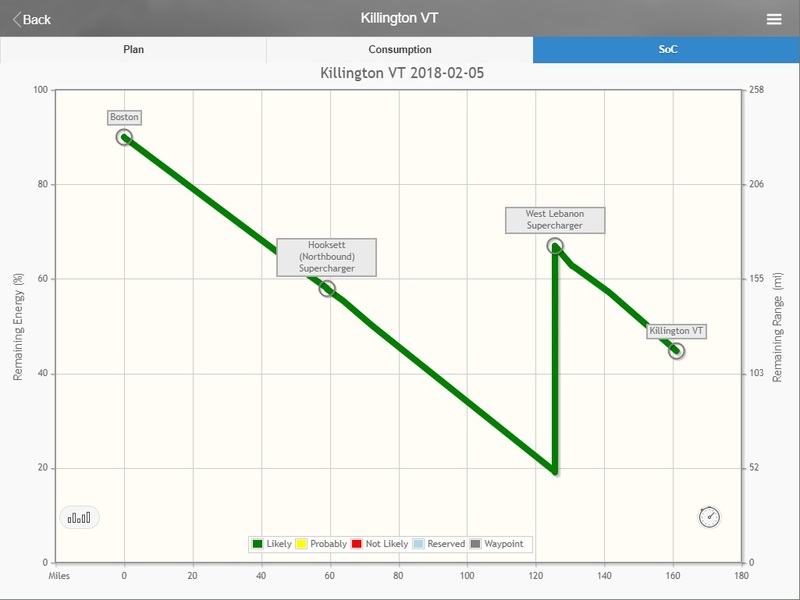 During the summer months we can make the trip to Killington in under three hours driving time. We usually stop at the West Lebanon supercharger each way for a few minutes but if we are conservative and the winds are favorable, we can even skip the outbound charging stop. For the winter trip this scenario will not be probable. It will be important to plan this trip carefully not only from an logistical perspective, but one of safety too. We don’t want to run out of energy on a cold, snowy highway late Sunday night. To understand the full effects of winter on this trip we will use EVTO and set the trip details appropriately. Select Edit Trip Details from the plan menu. We now have our trip starting on the correct date for our three day weekend and have indicated to EVTO we want to include the experimental battery heating algorithms since we expect cold weather during our trip segments. 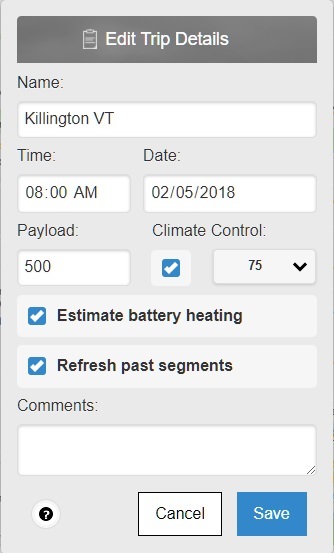 After setting the appropriate date for our trip and indicating we would like the battery heating estimates, we see that we will not make it to our destination without charging. In addition it appears that the car will be consuming 9.4 kWh of energy to heat the battery along the route. In the case of the Killington, VT stop we will not be plugged in to a charger so the cold soaked algorithm is appropriate. However we can eliminate the battery heating at the origin of the trip by preheating the car while plugged into an appropriate charger such as a Tesla Wall Connector. Currently EVTO is estimating a 2% loss of SoC for heating this battery at the start of the trip. If you select the Origin waypoint again you will notice the blue snowflake icon is gone and we once again have all of our 90% initial SoC available. We also need to set our return date appropriately. EVTO automatically created the next day as the default segment date, but we want to stay over two more days so we need to change the date for segment number 2. We now have our return trip set for Sunday February 7th at 4pm after a full day of skiing. 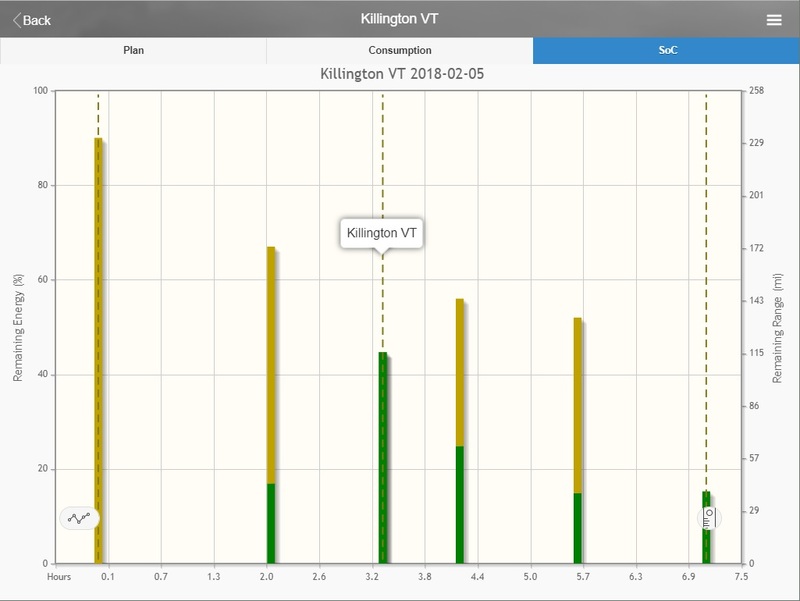 We are now ready to have EVTO do all of the energy calculations combining driving, elevation changes, weather impacts such as wind, precipitation and climate control as well as the need for battery heating while en route and cold soaking during our stay in Killington. 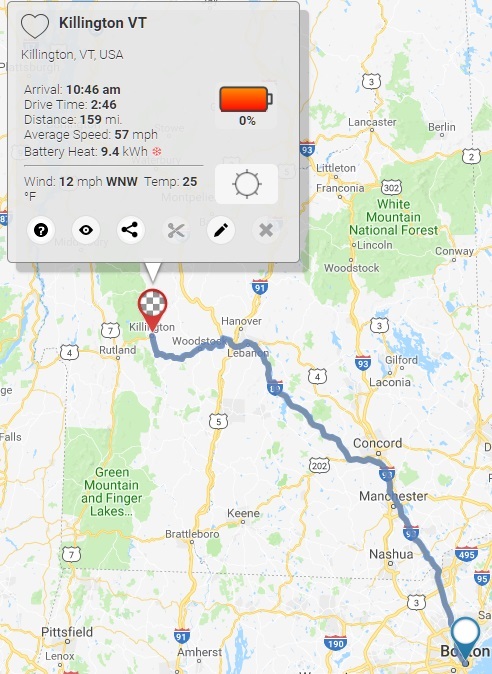 After a few moments EVTO will finalize the trip and show you all of the charging stops and charging time estimates as well as all of the energy consumed while driving. EVTO will also estimate the energy required to warm the battery both en route and after being cold soaked in Killington. The battery will assume to be warmed while supercharging but over time the ambient air will have a cooling effect that overcomes the heat produced while driving. EVTO takes all of this into consideration. You will notice that EVTO has added an optional outbound charging stop at the Hookset Supercharger. This is depicted by the gray pushin. If you feel comfortable with the arrival SoC at the West Lebanon supercharger as you progress during the trip, you may delete this optional charging stop. At times when EVTO detects inclement weather it errors on the side of adding an extra charger but indicating it may not be needed by marking it in gray and not estimating any charging time. What was a fairly easy one charging stop trip in the summer months can be a three charging stop trip in the winter. Not only does the car need more energy to overcome the colder denser air, but winds, precipitation and cabin heating take their toll on energy consumption too. In addition we have demonstrated that battery heating can be considerable. In this case over 17.1 kWhs was needed enroute with an additional loss of 4% due to cold soaking. This totalled more than 23% of the capacity of the 90 kWh battery, a significant amount and over the margin most would require during travel. This requirement meant that we had to stop at least two more times to charge than we would have during the summer months to achieve the most efficient travel time.